It feels like everyone and their mom was born between mid-May and early June. Not even kidding. There were like fifteen consecutive birthdays, some happening concurrently, the past few weeks. Bobby had requested a triple-layered ice cream cake for his birthday. I’m not entirely sure what the naming convention for cakes are. Does the number of layers refer to the number of cake layers or the number of total layers, ice cream included? In any case, I went cake-ice cream-cake for lack of resources, ingredients, and energy. 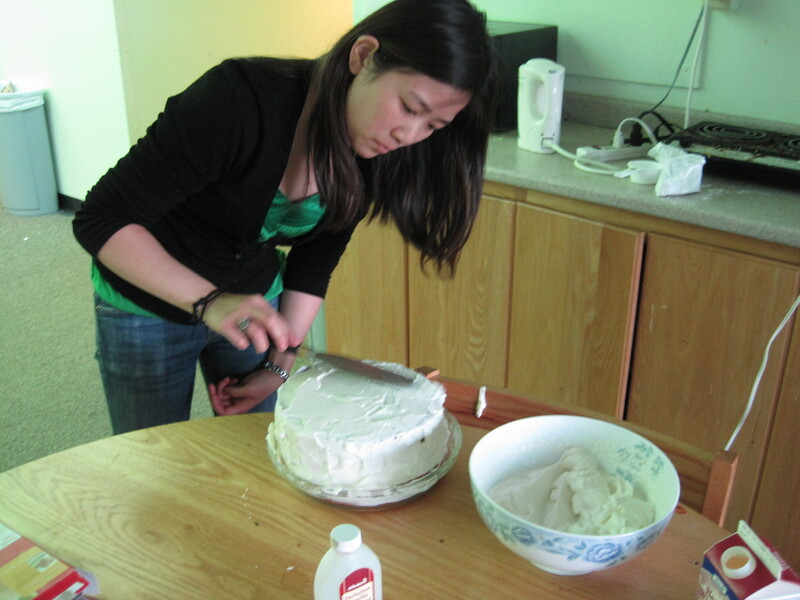 Making the cake layers was simple enough. A single box of angel food cake mix (shh) made the two cake layers, and a box of Neapolitan ice cream served as the middle one. At Bobby’s request, I made whipped cream frosting instead of cream cheese or buttercream. Freeze the cake layers. It makes them far easier to work with ’cause they’re stiff and not wobbly, and far less likely to rip when handled. MELT the ice cream before smooshing into the mold. I was impatient and failed to do so, and thus ended up trying to smooth the semi-firm ice cream with the back of a spoon. Very time consuming. Get one of those spinny cake decorating thingers, or at least something bigger than the cake itself. I tried to frost my cake inside the pan, which was difficult and ugly. 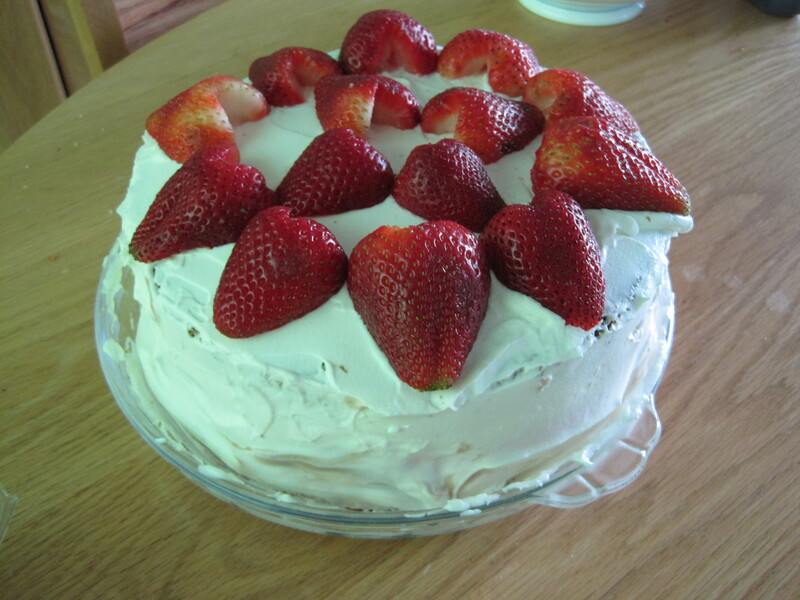 I topped it with strawberries cut into hearts (gross, I know…sorry). 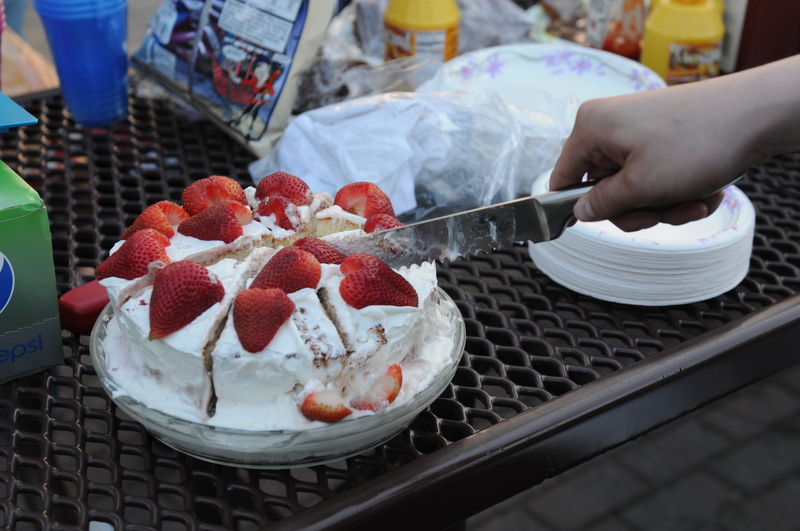 Strawberries are difficult to cut with a butter knife. Just saying. Bobby hosted a BBQ (a Bobby-Q hahaha) in honor of all the birthdays. 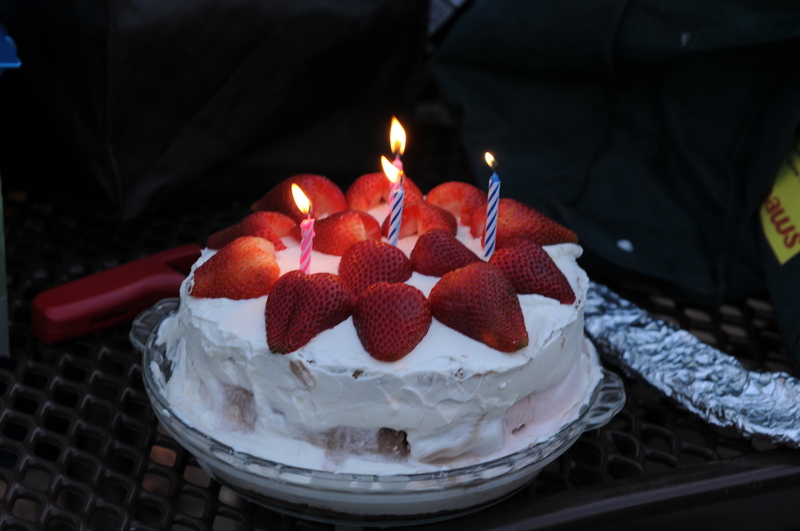 Candle were lit, cake was consumed, and waistbands were challenged. Oh! The whipped cream recipe. It tastes equally delicious on fresh strawberries and on your finger. Start with your cold whipping cream in a large bowl. Use an egg beater to…well..whip it. 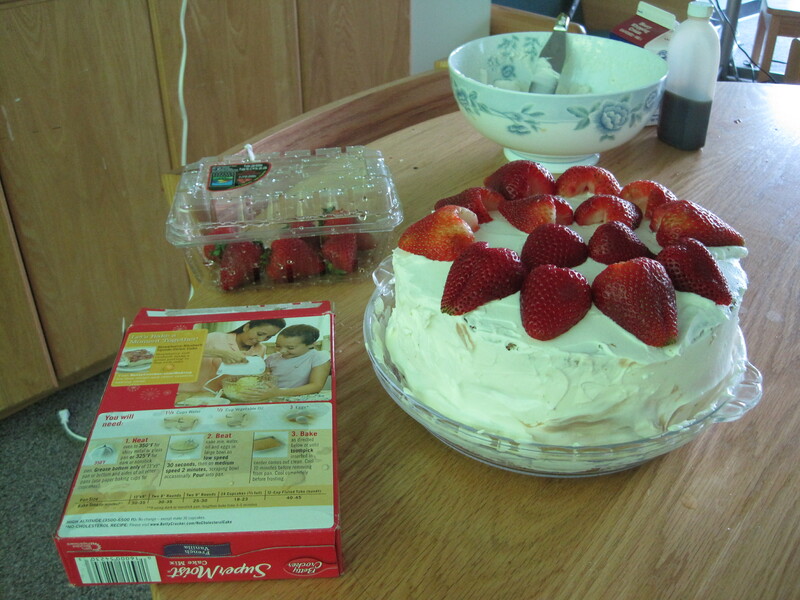 Slowly add the confectioner sugar, making sure each bit is fully incorporated before adding the next bit. Add the vanilla extract last. Beat until you get stiff peaks–for 2 cups each of cream and sugar, it took me about 6 minutes. Be careful not to under-beat, as the cream will separate. I’ve been told over-beating it is bad as well. Length of procrastination: Oof…’roundabouts half a day, including re-freezing the ice cream. She was sitting on the shelf at Rite-Aid with a little $19.99 tag in front of her. I walked past her and stole a glance. She glanced back. I walked past again, this time looking pointedly, but trying not to act too interested. She looked pointedly back. On the third pass, I stopped in front of her and stared. She stared back, flashing her cardboard box seductively so that the light bounced off the words “delicious versitility” and “fully automatic”. I nervously shifted my weight from one foot to the other, then stooped down to look her in the eye. She cocked her head and winked at me. I caved. Yes. I bought an ice cream maker from Rite-Aid. I dare you to judge me after eating some of the ice cream that comes out of it (I feel like using the feminine pronoun here would be inappropriate for some audiences). I don’t have $50 to blow on some gorgeous Cuisineart supermodel. My cute little Hamilton Beach does the job and does it well. Sure, her extension cord is only about a foot long. Sure, it takes an entire freezer full of ice, plus half a carton of salt, for her to freeze ice cream properly. Sure, she’s a bit bulky and unwieldy, but dangnammit, she makes a gallon of ice cream in the flavor of my choice. And that, my friends, is true love. I’ve made two kinds of ice creams so far: green tea and raspberry+apricot. The green tea was the honest-to-goodness best green tea ice cream I’ve ever had. It’s not made with a custard base (no eggs! ), so it’s got a much lighter texture–just like green tea is supposed to be. I’ve always thought that the store-bought versions were too creamy and too sweet, but this ice cream is absolutely perfect. Plus? No heat, so you can go from mixing bowl to mouth in less than an hour. The raspberry and apricot ice cream came out with a consistency more like frozen yogurt than ice cream, probably due to the amount of water in it. This didn’t bother me, but the apricot syrup did come with a whole ton of sugar, making the final product really crazy freaking sweet. Not that I’m complaining or anything, but I’d probably cut the amount of granulated sugar I put in by half if I were to make this again. Whisk the matcha with the milk and sugar, making sure the powder dissolves. Stir in the cream and vanilla. Chill in the freezer for 15 minutes, then freeze and churn according to your ice cream maker’s instructions. I made it up! Seriously. Combine milk, sugar, and salt in a saucepan over low heat until the sugar dissolves. Do not boil! In a medium bowl, whisk the eggs as you pour half of the hot milk mixture into it. This tempers the eggs so that you get custard instead of scrambled eggs when you pour everything back into the saucepan. Cook over medium heat while stirring until the mixture coats the back of the spoon. It’ll be nice and thick and almost gooey. Chill in the refrigerator (or freezer). While you’re waiting for your custard base to cool, scoop out your apricot halves and dice them. Save the syrup! Size doesn’t matter a whole heckuva lot. Just make sure you’re okay with that size apricot going into your mouth. Add the syrup and apricot pieces into your cooling custard. In a small saucepan, heat the frozen raspberries with a sprinkle of sugar so that their juices come out. Stir and squash them as best you can, then pour the raspberries through a strainer into your apricot-flavored custard. This’ll remove the raspberry seeds and residual pulp, but feel free to skip this step if you like the crunch. When everything’s cold, stir in the heavy cream and vanilla. Freeze and churn according to your ice cream maker’s directions. Ways to prolong procrastination: Repeatedly open the freezer door to check whether the custard is cool yet. The answer is no, and it probably prolongs the cooling process. Oops. I’m submitting these to the Ice Cream Social hosted by Savor The Thyme, Tangled Noodle and Scotty Snacks.